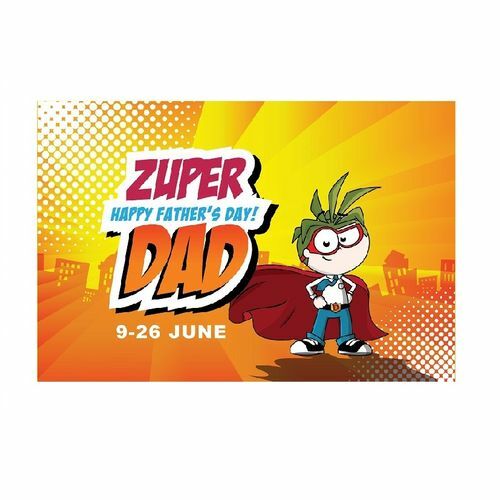 June Holidays are back and it is time for Dads to show their superpower strength as KidZania Singapore celebrates the multi-skilled Dad this June! Free entry for Dads, all through June! All fathers get to enjoy free entry to KidZania Singapore with every two walk-in kid tickets (SGD 116) purchased at KidZania Singapore’s ticketing counters. In addition the several Parent-Kid role-play activities available in-park, KidZania Singapore will be introducing new roles exclusively for Dads to join in the fun and bond with their kids. Showcase your culinary flair as you assemble your own Bento Set in different designs with your kids. Get in the groove with your kids and wow the crowd by becoming a star performer during the hourly City Clock performance. Create your own healthy mini cupcakes with your kids, and get creative as you decorate your carrot based cupcake with various types of fruits and nuts. Expect a bazaar at KidZania Singapore, with booths lined up along the City’s streets showcasing an exciting mix of product offerings and deals by KidZania Singapore’s Industry Partners for all visitors to savour. Superhero Dads are not afraid of heights! Be a brave Mountaineer and take on the High Ropes Challenge Course with your kids at the Mountaineering School. Be a Journalist and secure newsworthy topics with your kids, and witness your story come out fresh off the printer as the front page of KidZania Singapore. Join your kids as Assistant Petrol Station Managers at the Petrol Station, and learn more about the different types of fuel that keeps our City’s vehicles running. Make a difference to your health together with your kids, and put on your sports gear as you take on a friendly challenge with other dads and kids in a basketball game. Experience 2 KidZania Cities this June holiday. Always wanted to further your KidZania experience beyond Singapore? Now you can with our first-ever Two-City PaZZ to KidZania Singapore and KidZania Kuala Lumpur. Available for purchase at KidZania Singapore’s ticketing counters from 1 to 26 June. For more information, please log on to www.kidzania.com.sg. Part of the world’s fastest growing family edutainment phenomenon, KidZania Singapore is an 81,000 square feet kid-sized indoor city where kids 4 and above are empowered to Learn through Play, and develop life skills not easily learned through school as they live out their aspirations through more than 60 realistic role-play activities. Packed with realistic elements, KidZania even comes complete with moving vehicles and a working economy with our very own currency. KidZania Singapore is also the first KidZania City to feature a full-wing Boeing 737 fuselage, the first to be located on an island resort, one of the few to have a Mountaineering School and a Stadium, and the presence of 19 local brands to give guests an experience unique to Singapore’s culture. *Park opening hours are subject to change. Please refer to www.kidzania.com.sg for the latest updates.